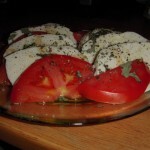 This is kind of a late post, since I made this caprese salad in October. But I guess better late then never. 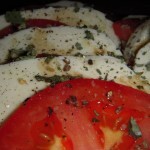 If you don’t know how to make a salad, then you should have no problem in making a caprese salad since it only has seven ingredients. 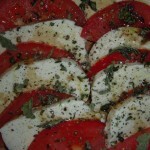 And those ingredients are fresh mozzarella, a tomato, olive oil, balsamic vinegar, basil, kosher salt and pepper. 1) Since I didn’t want to get fresh basil from the grocery store. 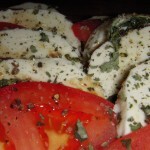 I just used some of the basil that I dried from my garden. 2) If you have some nice salt (black salt, red salt, etc) by all means use it. I just happened to use kosher salt, even though I had some red salt on hand but forgot to use it. 3) For the olive oil, I used some extra virgin olive oil that JRR got for me a while back.